Meris is a new name in digital effects, but its credentials are impressive. We get to grips with two units that promise two interesting flavours. You might not know the name Terry Burton – but you’ll know his work. He started out as a hardware designer at digital effects pioneer Line 6, before leaving to form Strymon, which has quickly become the darling of the high-end effects scene. He’s since moved on again, to form a new company, Meris. 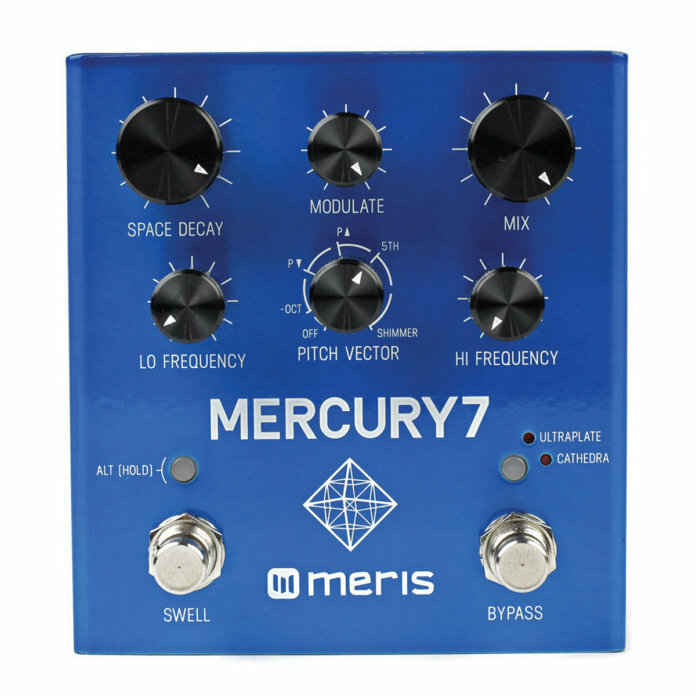 That’s some serious effects building pedigree by anyone’s measure, and while Meris has focused on building boutique studio effects modules up until now, the company’s first proper effect pedals should have all of us taking notice. As you might expect, the first two entries in the range are based on the company’s 500 Series studio units, but converted to stompbox format and tweaked to suit the peculiar needs of fretboard-botherers. 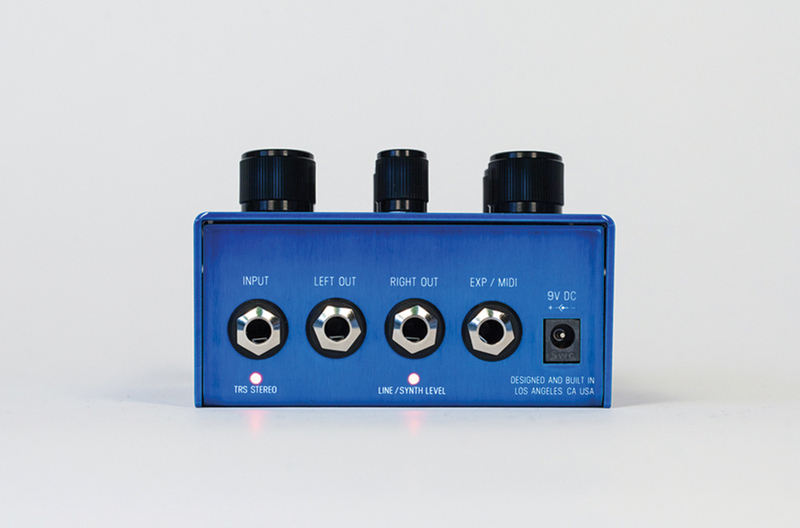 The pedals are built in California, and the two share some key features: stereo ins and outs, 24-bit AD/DA conversion with 32-bit floating point DSP, switchable true or analogue buffered bypass, and the ability to use an expression pedal to control multiple parameters. They run on nine-volt power, and each one comes with a DC adaptor in the box. You could run them off a standard power supply if needed, but only if it can spare 150mA of current. 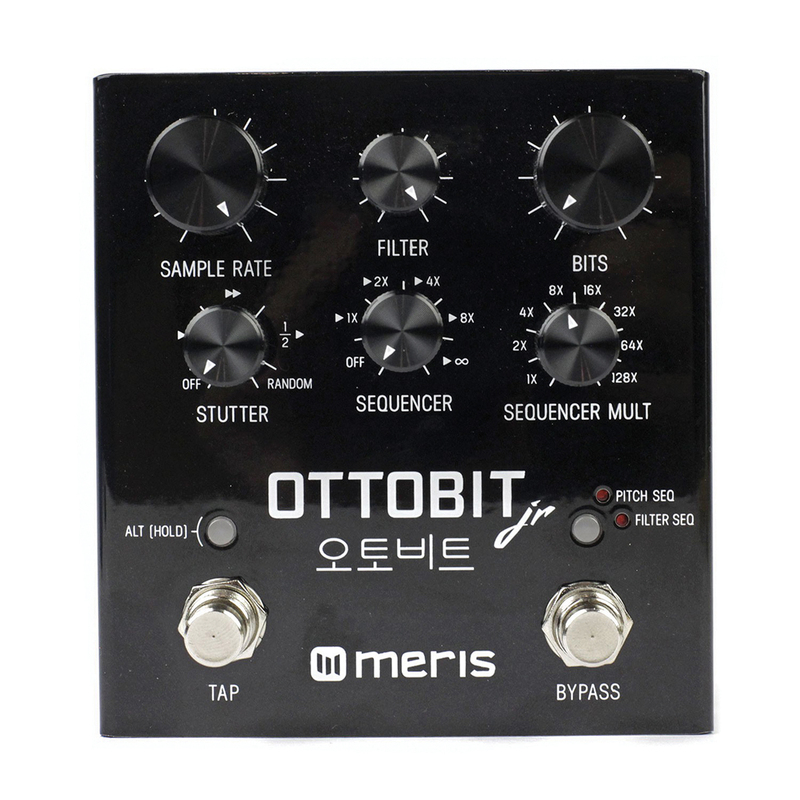 If you include the word ‘bit’ in the name of your pedal, people are going to assume it’s a bitcrusher… and in this case they’re not wrong, but Meris is keen to stress that the Ottobit Jr does more than just pulverise your guitar sound into a mess of digital distortion. We’re told it’s inspired by vintage gaming consoles – and that means a variety of bleepy retro synth sounds as well as glitchy stutters. 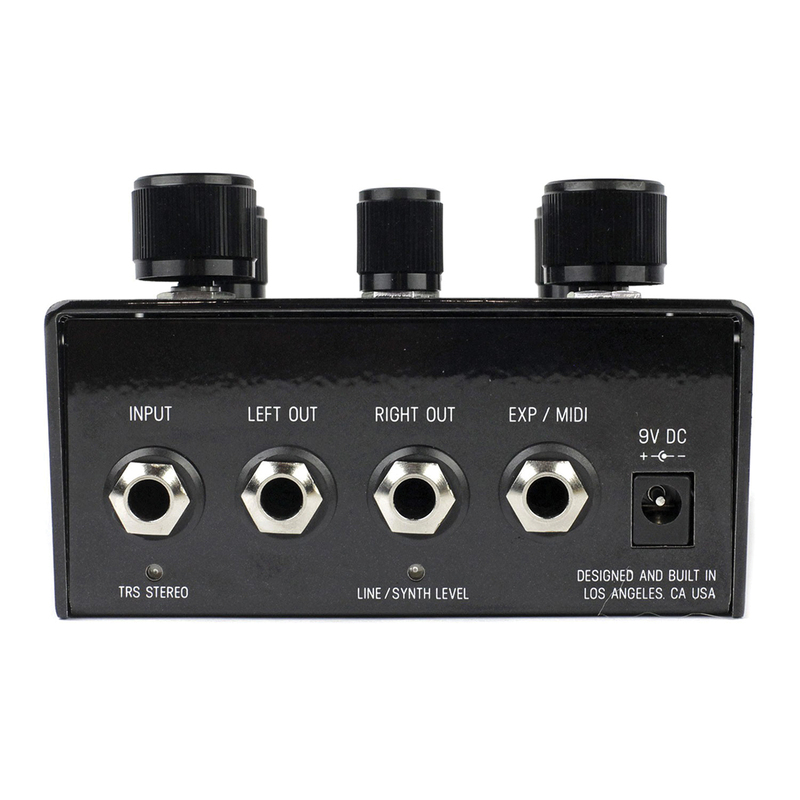 The six knobs are best understood when split into two rows: the top three are all about lo-fi filtering, while the bottom ones deal with sequencing/stutter patterns. There’s also a push-button next to the bypass footswitch to hop between sequencer types, and a tap tempo footswitch. Oh, and all the controls have secondary functions for adjusting the sequencer steps, accessed by holding down the ‘alt’ button above the tap switch. Now let’s be honest, it’s complicated stuff, and there’s a 14-page manual that you may or may not be inclined to read – so expect some trial and error. But that’s fine, because there’s really no such thing as ‘error’ when your mission is destruction and chaos. It’s a simpler device all round than the Ottobit Jr, and even the secondary functions of the six controls are easy to understand once we’ve looked them up in the mini-manual that comes in the box. There are only two reverb algorithms to choose from – cathedral and plate – but the key here is the pitch vector dial, which lets you add a shimmer effect and control its harmonic interval from the source note. Also worth a mention is the swell footswitch. This suppresses the note attack for ’verby volume swells without the need for some dextrous pinkie action on the guitar volume. It’s possible, in the name of sanity, to start exploring the Ottobit Jr with the stutter and sequencer controls at zero. This way you’re only hearing the filter effects – and they’re quite something. Being able to control sample rate and bit depth means you can choose just how lo-fi and grainy the sound gets, from more or less pristine at one extreme to utterly crushed at the other. Combine this with the sweepable low-pass filter – especially if there’s an expression pedal handy – and you’ve got some cracking old-school synth sounds available here. Now we bring in the rhythmic effects, and any semblance of ‘guitariness’ is blasted into hyperspace. The sequencer can sound almost like a sample-and-hold filter, or an arpeggiator, or a bit of both – and the real fun comes from setting it to infinite repeats then exploring how the other controls interact. It’s great for making outlandishly weird sounds with a clean guitar, even better with a distorted one, and – sorry about this – better still with something that isn’t actually a guitar at all, but an analogue synth. The Mercury7 is a return to six-string normality after all that atonal extremism. Go easy on the decay and mix controls, with the pitch vector set to ‘off’, and you’ll have a sweet and clear reverb with the ability to fine-tune the high and low frequencies and add lush modulation to taste. However, turn everything up, including the pitch control, and a world of sci-fi strangeness opens up. You can even store two different pitch intervals at either end of your expression pedal’s travel – say, an octave up and an octave down – then swoop woozily between them. Multi-mode switching has become a pretty common feature on modern reverb pedals, but Meris has opted to not include it here, so you can’t hop between three or four dramatically different sounds. However, you can store presets – just like the Ottobit you can keep up to 16 of them –provided you have an external MIDI device to call them up with.